eTech kick started the summer season with an all employee table tennis tournament. 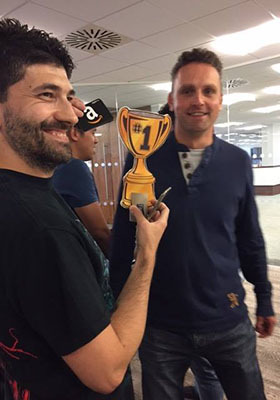 The ping pong games were a fun initiative which took place at our offices, bringing together colleagues from all teams across the business for some friendly competition. The ping pong matches started at the beginning of May and lasted a total of 8 weeks with over 100 employees taking part. Seven rounds were played including quarter finals, semi-finals and the ultimate final! The final match was played by Torin Pitchers vs Ricardo Silva with Ricardo taking the top spot as eTech’s champion ping-ponger, winning 3-1 in the end! Here’s to the next office tournament – air hockey anybody?